What's with this obsession in changing the look? As one flips through the TV channels he finds shows on women (and even men) changing their looks everywhere, Beauty Clinic, The Swan, Change my life (ghayerli 7ayati), Anti Ajmal, bil sara7ah a7la etc etc.. and people going through a number of plastic and cosmetic surgeries, too much pain and so much stress, this doctor is cutting here and that one is filling there, until eventually they find themselves artificially beautiful! As one walks in the streets he finds women with bandages of all shapes and sizes on noses, necks, around the heads and everywhere... What's going on?! I personally see nothing wrong with elective surgery. And no matter what people claim, outer beauty does count for alot and surely does factor in how people are treated. Ahhh..the wonderful world of crazy stuff goes on..as usual..unusual! Did anyone say Ahmad?? where is he?? I think that cat with a dashing smile is his! 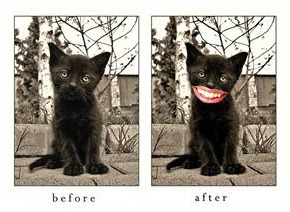 see milk does make your teeth stronger afterall..ask ahmad..and smiley the cat. We on the other hand, have superstar and haifa -madame courie-wahbi. It's all about "extreme" these days! Well, a girl can dream.. I can never go under the knife for a nip and cut. May be a fresher look, newer hair due, just some little changes where people can still recognize me after am done. I guess this is how they think about it! after all it's their bodies and they are free to do whatever, but they all end up looking alike. bardo a minor make-over (zai bel sara7a a7la maslan) won't kill anyone, it feels good doing something new for a change! Outer beauty does count for sure, we can't deny that. 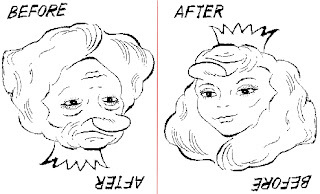 and it's very important to take a good care of our outer appearance and go for a little change every now and then. What's wrong in my opinion is being too obsessed in having a "perfect" look and go for surgeries not necessarily for correcting something but just bcuz it's a trend and bcuz I want a nose like Haifa's and a mouth like Elissa's! I know that one gets more satisfied and more confident when he looks prettier but is it really satisfying when he looks at the mirror and see the image of someone else and not his even if this image was fascinating, is it really satisfying when he knows that all is fake? I don't know but I'm against resorting to plastic surgeries except for solving some serious problem. Dima and Ammar, I've just posted pictures from Ahmed's birthday. Really this is noisy! it s all men's fault.. they kept nagging and nagging they want super (beautiful) women! and women only seek for men's attention so that they get more and more stupid to go along with men bcoz they want to feel wanted.. this is absolutely one of the worst results of empty spiritual life our ppl have.. I loved what you said loza, so true..